Don Glory is a professional boxer. He is very good at his trade, winning fight after fight and gathering a decent reputation and an impressive following. He might have stayed out of his future side business and just kept pounding opponents in the ring if it were not for his fiancée's demand that he stop the fighting. This is a vital part to the Glory saga and a rather ironic one. June Brent is the daughter of a very wealthy, indulgent and loving father. She is also very much in love with Glory and her father has no problem with the fact that his future son-in-law makes his living with his fists. Not so with Ms. Brent, however, and when we first meet both Glory and Brent, they had just broken up. Well, she broke up with him. He just got miffed and quite put out, both figurativly and literally. So, ticked that his gal no longer wants anything to do with him because he had promised to give up fighting and then gotten into the ring again anyways, Glory is wandering down a street feeling sorry for himself when he hears rowdiness from inside a storefront. Curiousity draws him in and he hears an orator calling for the small crowd to force the government to obey the demands of the Fatherland. Glory, already in a rotten mood, takes considerable exception and breaks up the rally with his usual weapons - his fists. That puts Glory in the mood to take his new activity on the road, fighting the enemies of his beloved country wherever he can find them, at home or abroad. No one has asked him to take on this task and it does not look like anyone is paying this red-headed pugilist to do this but he loves punching things and walloping denizens of dictatorships and would-be saboteurs and like seems like a great activity. Meanwhile, Ms. Brent quickly decides that she sees his point of view and realizes that Glory is better off with her in his corner than out by himself. Well, usually. 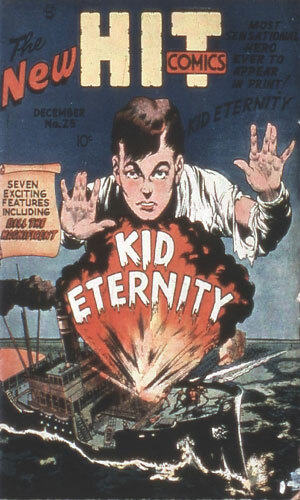 One of the pioneers in the comic book industry was Quality Comics, a publishing company that got its start in 1937 and managed to last for nearly 20 years, impressive in an industry that saw many would-be's come and go. Quality would not only last for two decades, it would be bought by DC Comics and find several of its key characters adopted into that universe. 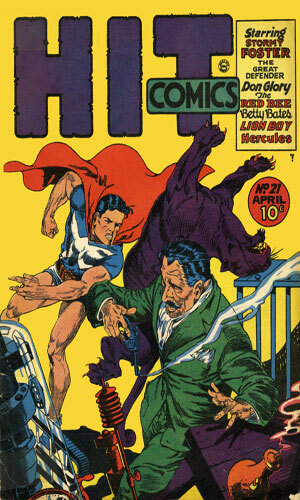 Blackhawk, The Spirit, and Plastic-Man are three of the biggies but there were several others of note. 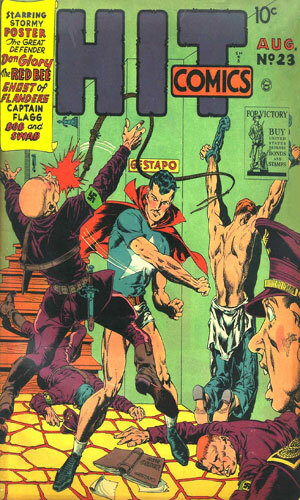 One of its many lines was Hit Comics which was, like many of the others, an anthology. 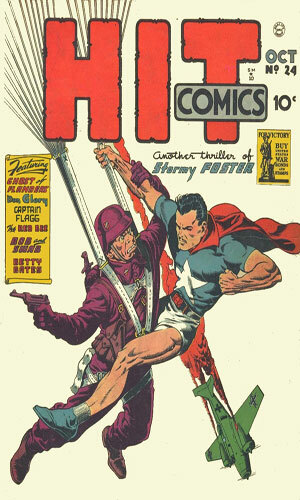 For 19 of the 65 issues that the line put out (#8-#26), one of its characters was Don Glory, Champion of Democracy. Note: the numerous stories in the series had no title to them so I made up my own, putting them in quotes. From Hit Comics #8 - When Don Glory's beautiful (and rich) girl friend decides to break up with him because he has not given up boxing, he turns over a new leaf. That starts when he hears a small beer-hall group talking about overthrowing the US government to align with the Fatherland. Glory's fist fighting comes in handy as he tracks down the big boss. 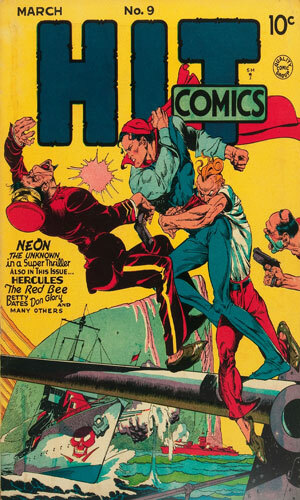 From Hit Comics #9 - Since Don Glory's girl friend frowns on his using his fighting abilities, he boards a ship heading to Rio to see if he can use them for democracy down south. 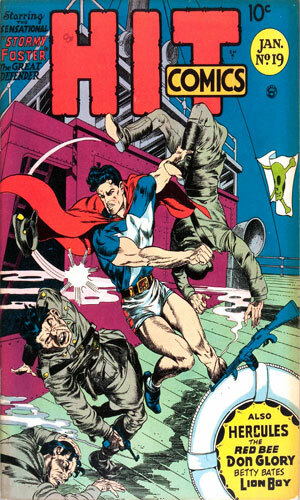 June follows him and helps uncover a Bund gang trying to destroy Brazil's trade with the U.S.
From Hit Comics #10 - A rich arms dealer wanting to get richer decides he needs to stir up public support for entering the War. Don Glory goes to battle with him in the name of peace. From Hit Comics #11 - When scandal in the US armed forces makes the headlines, Don Glory suspects that foreign agitators are at work. When he convinces a magazine publisher to lend him a photographer to go snooping, both find a whole lot of trouble. 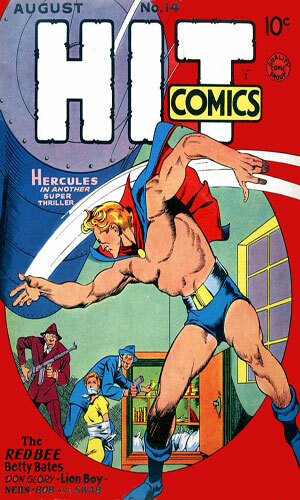 From Hit Comics #12 - June Brent's brother, Johnny, an undercover investigator for the government, has gone missing at a airplane factory which has suffered recent sabotage. She appeals to Don Glory to look into it. 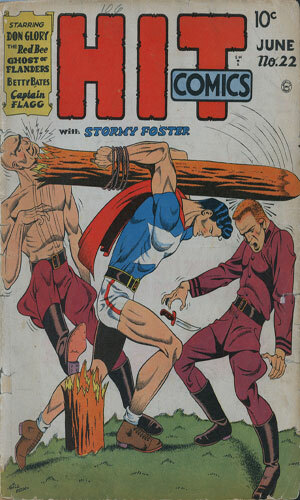 From Hit Comics #13 - The leader of a fifth column pack has been captured but Don Glory knows another will be sent from overseas to take his place and he wants to be there when he arrives. From Hit Comics #14 - Seeing a man buy an expensive camera for a fishing trip to Newfoundland, Don Glory gets suspicious (no idea why). He follows the man up north and learns the guy is out to spy on a new naval base being built. He also finds a whole lot more. 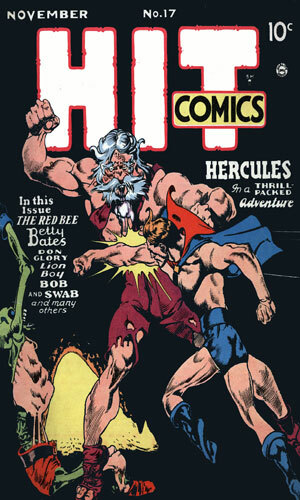 From Hit Comics #15 - Much to June Brent's ire, Don Glory steps back into the ring for a charity bout. He is KO'd due to his water being doped. He learns that a fifth columnist was behind it for revenge and for money. Glory gets upset at this and goes after him, learning the man is also planning on blowing up a bridge to kill some members of Congress. 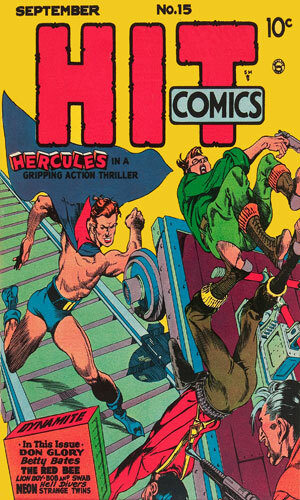 From Hit Comics #16 - Seeing something he thinks suspicious while driving passed the cargo ship Sirocco, Don Glory goes snooping and finds a pack of 'anti-Allies' up to no good. 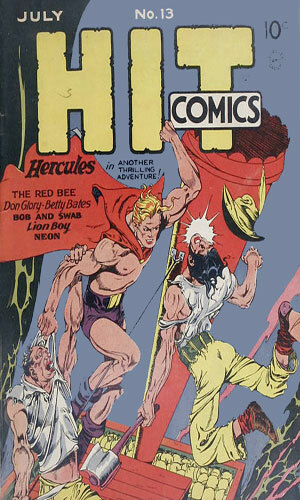 From Hit Comics #17 - Doing another charity fight, Don Glory's opponent goes down too easily. Glory finds his glove has been doctored with a thorn painted with curare. Someone wanted the opponent put down for good and Glory wants to know who and why. 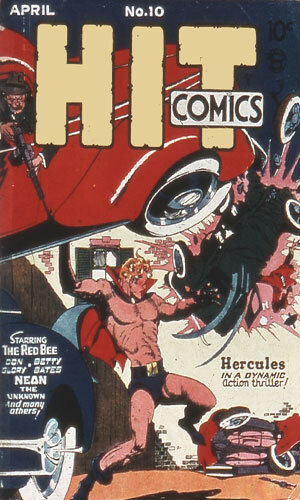 From Hit Comics #18 - Don Glory's prized automobile was stolen and used in a robbery at Fort Knox. 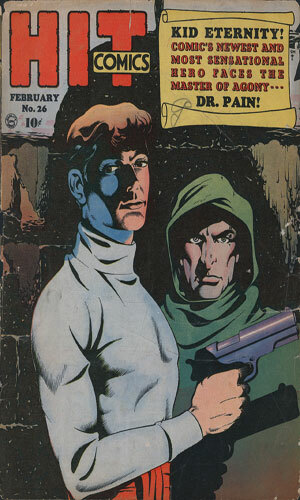 He and June Brent head there to investigate but are slowed by dynamite wired to the spark plugs (interesting!). Later June is kidnapped and Glory drops a car on one of the bad guys. From Hit Comics #19 - Don Glory gets June Brent a job at a printing company to keep her out of danger while he goes on another investigation. Unfortunately, some in that company are printing secret documents and resent June's discovery of it, putting her in considerable peril. 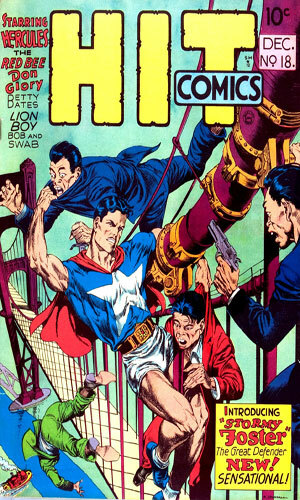 From Hit Comics #20 - Allowed to observe the US Army in war games, Don Glory speeds off to help when a report of an accident comes in. He finds infiltrators have been using the exercise to hide some no-good actions. 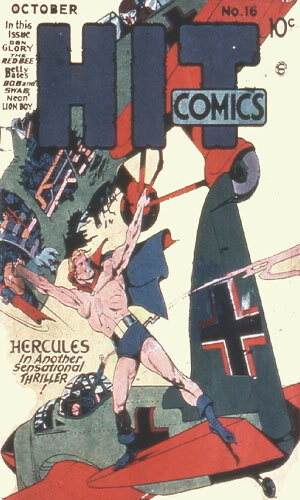 From Hit Comics #21 - The crash of yet another Army bomber has Don Glory certain sabotage is afoot. The planes all fell apart after flying through suspicious clouds. Don Glory, being a pilot himself, is given a bomber to use in investigations. 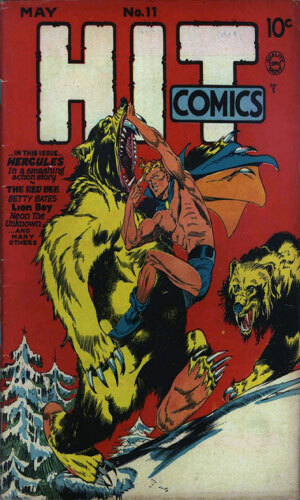 From Hit Comics #22 - At yet another charity boxing match, June Brent has bet $10,000 on a French boxer who is then drugged. Don Glory goes on in his place. He learns the proceeds have been stolen by three of "Hitler's Stooges" and goes after them. From Hit Comics #23 - Bongo is a foreign agent who has a tricky "radio ray" which blocks out all sound for a short radius. His henchmen use the silence to rob banks because the "Nazis needed the money". Bongo improves the device to shut off all engines just when June Brent is driving by his house. 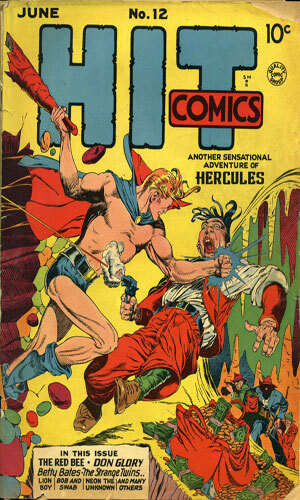 From Hit Comics #24 - An obnoxious boxer is winning all his fights through an odd form of hypnotism. He is being backed by Nazi operatives who are betting huge sums of money on him to fund their subversive activities. Don Glory gets involved when the boxer makes a pass at June Brent. From Hit Comics #25 - Don Glory stepped peacefully in the Chinese laundry to pick up a shirt. Next thing he knows he is abducted and on a plane for Tokyo to take on the Japanese army. 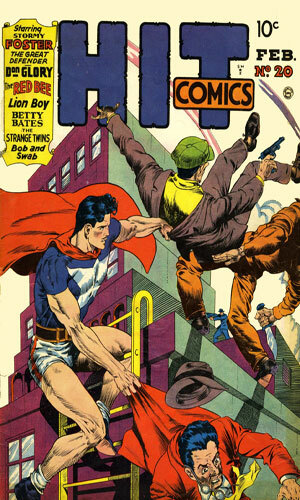 From Hit Comics #26 - As Don Glory and June Brent are driving by a dive, they see a soldier being thrown out by a bouncer. Curious, Glory asks the GI and learns he was taken in a crooked roulette game. Naturally, Glory has to get involved. I will admit that Don Glory is not your typical spy but then again looking at the wide variety of members of this compendium, the atypical are obviously welcome. Glory is a boxer who, when forced by his fiancée to give up his heavy-weight career, looks to enemy agents as a outlet for his pugilistic urges. Since nearly every person he goes up against is an enemy agent or working for one, that made him a prime candidate for membership. The action is fast, the stories are short, the traps often silly and the escapes unbelievable but through it all, Glory manages to right the wrongs and pow-zing-oof those fifth columnists and Bund members into submission. And despite his fighting in every single adventure, he still keeps the lovely June Brent as an intended.